A great world and an interesting story, but this short second entry lacks the tense decision-making of the first. Murder, prostitution, black magic and cigarettes are the four staples of '80s New York Fabletown. 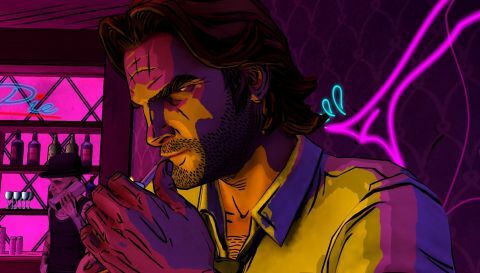 The Wolf Among Us is an adventure game about once-idealistic fairytale archetypes clashing with contemporary urban decay. Toad of Toad Hall, the Big Bad Wolf and their compatriots are ghettoised, poor and distanced by eons-old grudges. It's a great setting for a hardboiled detective story. Episode two of five, Smoke and Mirrors, opens in a basement with a restrained suspect as Bigby continues to track down episode one's serial killer. In its exploration of the deputy mayor's office and the Woodland apartments, episode one devoted itself to the powerful and relatively privileged. Episode two is about grungy neon dives, pimps and cadavers. You inspect a body in the Witching Well, you shake down the owner of a sordid strip joint. Good detective stories use the central mystery as an excuse for social tourism, and episode two leads us into Fabletown's underworld. Bigby is an interesting guide. Wherever he goes, he's feared, hated and respected for his monstrous past. As a player, it's fun to hop in and play with that unearned power. The degree to which you help Bigby to retain his reformed status will surely become one of the central crises of the series, but like a number of episode one's loose threads, it goes relatively unexplored here. It's unapologetically a work of interactive fiction. You won't fix a stop to fix a train, or combine items to make a disguise. The game's conversations are its puzzles, and you tumble from one to the next with little freedom between. The vestigial inventory screen implies a level of interactivity that isn't there, but that's fine. It's a choose-your-own-adventure in a dark, violent, interesting world, enriched by splendid art design. It's a shame the scenes are so rigidly arranged. A crucial choice in episode one asked you to decide which of two troubled characters to help first - a decision with severe consequences. In another exciting instance you had to watch an intruder ransack an apartment and decide precisely when to intervene. Smoke and Mirrors denies you that flexibility - you hardly ever get to walk around - and it lacks episode one's life-or-death snap choices. Crucial moments are where you decide the extent to which you'll offend or appease other characters, but if there's any payoff to these decisions, it's hidden beyond the reach of this episode's very short plot. The final revelation injects sudden impetus, but the prospect of waiting three-to-six months for resolution makes the cliffhanger more painful than enticing. Future episodes may imbue Smoke and Mirrors with retrospective significance, but on its own it feels like a brief setup for more important revelations to come. I'd give the series another episode or so before deciding to buy in, but I remain hopeful. The setting is fantastic. It looks beautiful. The Wolf Among us still simmers with potential.